Just wanted to let you know about some new products and coming events happening at Valley Fabric Shop. We have been busy as little quilting beavers making samples and opening boxes of goodies to share with you. On Friday the 22nd, at 6:00 p.m., we'll host an hour of "Stash Magic". 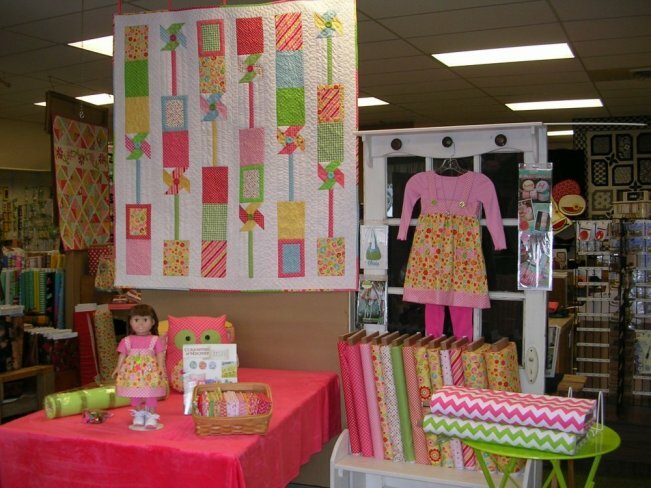 Great demonstrations, samples, and patterns using your stash and pre-cuts, such as charm packs, layer cakes and jelly rolls. During those three days all fabrics will be on sale, 20% off, 1/2 yard cuts or more. We have lots of new samples hanging in the store, so save a little time to spend with us during our sale! We will also have a trunk show from Marcia Layton Designs. She designs these very appealing wall hangings with yo-yo's, ribbons, button, and rick rack embellishments. Did you know Chevrons are HOT! HOT! HOT! We have chevron fabric in many different colors. We also have new chevron ribbon and buttons in a variety of colors, and they coordinate with all Riley Blake Fabric It is a great time to be in the creative mode! Tired of working without enough light? Try the new Stella Light, an LED affair that gives a natural light. It can sit on a table or right by your machine. Makes a very nice gift! The Quick Ripper is a nifty little notion, runs on a battery and allows you to buzz right through a seam that needs to be undone. It's the ultimate seam ripper. You'll want a scissors keeper by Just Wing It, a local artist. A colorful and unique way to put a mark on your rotary cutter, key chain, scissors or other tools. If you haven't tried the new Jumbo Wonder Clips, you are missing out. They open wide to hold many layers of fabric, as in binding. They also are a great alternative to pins when working with minkee and other heavy fabrics. If you didn't see our Hot Bowl, Hot Pad pattern at our last Saturday Sampler, you are in a for a treat. They are a perfect bowl shape and will keep your hands from burning when lifting dishes out of the microwave. Made from fat quarters, stash, or leftover fabrics, they are versatile, decorative and handy. Great Christmas gifts for neighbors and friends. Cotton Candy is a darling new pinwheel quilt designed by Geralyn Powers. Made from bright fabrics, it is an easy fat quarter pattern. It would be a perfect baby quilt, or cover up for spring. We have a horde of new doll shoes for 18" dolls. Tennis shoes (honestly, these are so adorable you'll want a pair just to make you smile) crocs, and boots in a variety of colors. Stash some away for your favorite little dolly and her doll. Check out a new pattern for Zippety Bags, a little project from a couple of fat quarters. These amzing little zippered bags store all kinds of treasures. They unzip and store flat, make them in three different sizes. If you like selvages, you'll love Save the Selvages, a book by Sandy Thompson. Have you noticed the pretty edges on the newer fabrics. These are great for the many small projects in this book. Warning: This book may cause addiction tendencies! Talk about creative . 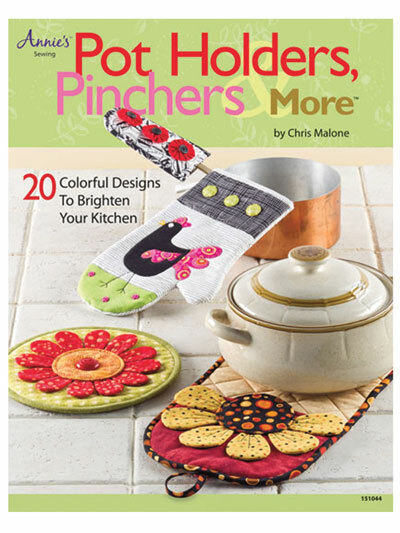 . . Pot Holders, Pinchers and More is a book containing 20 colorful designs to brighten your kitchen. Some of the cutest pot holders we have EVER seen! Great for using scrappy fabrics and also a nice way to make very practical, but pretty, gifts. We have new Bali Crackers, these are actually layer cakes from Hoffman cut from handpainted Batik Squares. Luscious and sew (!) versatile. Keep your computer, tv, and cell phone screens, cameras, eyeglasses and more clean by using the fast2clean microfiber cleaning cloths. Featuring quilt designs, the package contains four cleaning cloths of various sizes. Very handy. We have a bag made from Bailey Island Hobo, comfortable and easy, just like an island vacation. Okay....that may be stretching it a little, but the bag is very, very nice. "What Was She Thinking" Rug pattern is quite amazing. Use your old fabric, or buy some new and color coordinate to your home decor. It is designed as a rug, but makes a wonderful wall hanging, or table topper. Sweet Tooth fat quarters are delicous fabrics from Benartex featuring all kinds of candies, cupcakes, chocolates and other goodies. Great for small projects and create wonderful conversation. 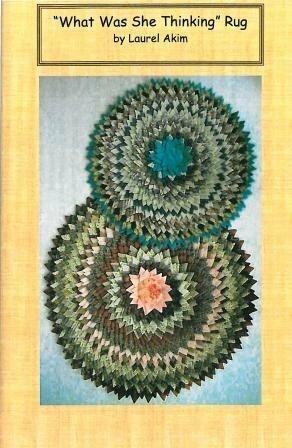 For all of you paper piecers out there, Paper Piecing, Perfect Points is a new book from That Patchwork Place. Give your quilts a few sharp points and discover the bold looks that you can achieve with paper pieceing. Be sure you have a working knowledge of your machine before you come to class. Featured in the photo above . . . you will love this project. Choose the colors you prefer. Learn three different methods of applique using your machine. This is a technique all quilters will use. Come and sew as long as you like! Make this beautiful bag in one of two sizes by strip sewing with batting enclosed. Fun! Chenille isn't hard to make, but you will learn some important pointers and tips taking this class. Use the fabric of your choice. Don't forget our special event, Stash Magic, on Friday, March 22 at 6:00 p.m. There is NO CHARGE, we'll have a stitchin' good time, refreshements, late shopping and fun. See you there!